Wondershare DVD Creator for Mac is a powerful Mac DVD burner designed for Mac OS users to edit and burn their videos files to DVDs. This Mac DVD creator supports almost all popular video formats. It organizes your videos into slideshows, complete with highly customizable DVD menus. It also provides you with flexible functions to edit your videos such as cropping video, trimming video length, and setting video effects etc. 1.Burn videos to DVD with high speed and excellent output quality. 2.Support all popular video formats including AVI, MOV, FLV, MPG, MP4, M4V, MPEG, DAT, VOB, 3GP, 3G2 etc. 3.HD video (TS, TP and TRP) formats are also completely supported. 4.Provide you with various styles of DVD menu templates and allow you to edit your template. 5.Let you crop video to remove unnecessary video sides. 6.Let you trim video length to capture your favorite video clips from your video files. 7.Let you adjust video contrast, brightness and saturation, and apply video effects to your video files. 8.Come with a very easy to understand interface design that lets you burn video to DVD with just a few clicks. Qweas is providing links to Wondershare DVD Creator for Mac 1.0.4.4 as a courtesy, and makes no representations regarding Wondershare DVD Creator for Mac or any other applications or any information related thereto. Any questions, complaints or claims regarding this application Wondershare DVD Creator for Mac 1.0.4.4 must be directed to the appropriate software vendor. 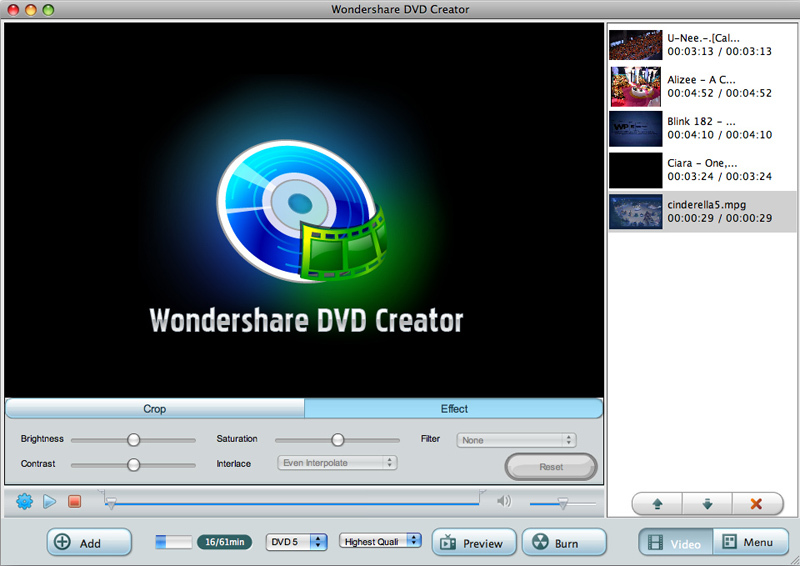 You may click the publisher link of Wondershare DVD Creator for Mac on the top of this page to get more details about the vendor.